If you are planning a wedding, you are fully aware of the fact that you will be spending most of your efforts on deciding the aesthetic qualities of the event. One of the most important details besides booking venues, entertainment and catering services is, of course, the ensembles the wedding party will wear during the event. But even more crucial than that is the bride's wedding gown for the day. 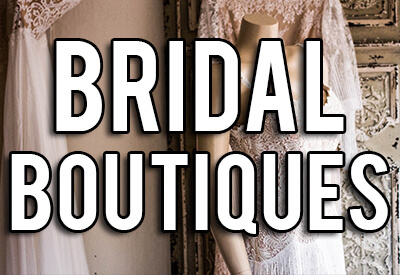 It follows that most if not all brides want to look beautiful and elegant on the day of their wedding, but it takes a special kind of shop to fulfill the vision she has in mind of the dress she wants to wear for her dream wedding. This fact alone may make this aspect of the process seem daunting, however, Atlanta is abundant in great bridal dress shops. We have a helpful guide which will help you find the right shop, which will supply you with the perfect dress for your dream wedding. A good place to start your search for any vendor is based off of the recommendations of your friends, family, and colleagues, in particular, anyone who has been married recently, or has been involved in a wedding to some degree. It is also a good idea to ask the venue coordinator of the reception hall or ceremony venue for their recommendations as well, they may have a list of referrals for clients if the venue is wedding-oriented. We also advise cross referencing any candidates online via wedding directories or guide websites. These sources are great for users looking for information on wedding vendors, including bridal shops, they provide details on pricing, reviews, bridal testimonials, pictures, videos, etc.! It is always wise to go directly to individual bridal shop websites to get a sense of each candidate's ability to present and market themselves to their potential customers. Once you have a good list of bridal shops, you can either call up, and make an appointment, or you can just visit on a day and time that will not be incredibly busy for them. Now that you are ready to go about scoping out the various bridal dress shops on your list, you will want to prepare plenty of questions for each candidate, and you will want to be sure to share your vision of the dress and the rest of the wedding with the salesperson or designer. It is important to ask them questions such as how many years of experience they have, and how long the bridal shop has been in business for. You will want to ask them how many customers they average a year, which will help determine if they are a quality shop or not. It is also important to get a scope of the shop, and see how well each candidate presents and organizes it. It should be clean, and the dresses ought to be in immaculate condition. You should try on dresses, and take some time deliberating on if this place has the dress you want. If they do, you will still want to discuss the costs of everything. It will help to ask for a sample invoice from each shop so you can do some comparisons side-by-side at home to help determine which candidate will provide you with a dress that meets your expectations at a cost that will not bankrupt your budget in that facet. Once you have found the right shop, it should be simple enough to get the ball rolling. You should sign a contract that outlines every single detail of the transaction, and then place a deposit, most shops require you to place one. Now that the dress burden is off of your shoulders, you can look forward to how beautiful you will look on your wedding, and use that as motivation to tackle the other tasks.